Relive the drama of Tacoma's historical Pantages Theatre. Bay windows frame the high four-poster oak carved queen bed, with wonderful views of the harbor below. Once the mother’s room and nursery, the Pantages Suite encompasses the entire front of the house on the second floor. Enjoy opulent surroundings, private sitting room, one-of-a-kind antiques and theater memorabilia with high ceiling frescoed walls, period gas/electric chandelier, flat screen TV, Wifi, oversize double Jacuzzi in alcove with leaded glass rosette window overlooking the bay. Private bath with large shower. Custom italian renaissance bedding by local artist, hypoallergenic down comforter and pillows. Over 500 square feet, the Pantages Suite is very open and spacious. Newspapers tell us that the social elite were in awe of Lucy Manning’s private quarters, where “everything was golden”. We have tried to recreate this golden effect through the use of gilded mirrors, hand-made Italian tile, polished brass fixtures, rich oak woodwork and golden frescoed walls. The Jacuzzi, of course, is pure period Victorian (Lucy would have loved it). An Eastlake carved table and upholstered chairs sit in front of the bay window and a large writing desk, from which you can look out over the bay – definitely an inspiring place for checking your email, journaling, or report writing. There’s also an oversized comfy chair for settling in with a good book. 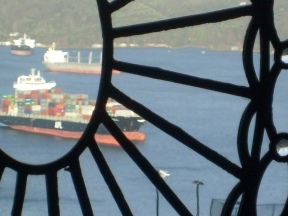 Although we can’t promise that you will capture the exact moment that one of our guests did in the photo, cargo ships pass by almost hourly, many of them anchoring in the bay just below. 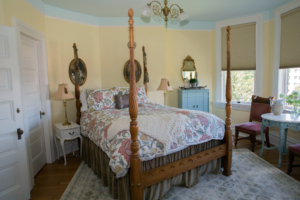 Guests tell us that the best seat in the house is on the edge of the Jacuzzi, gazing out at the ships through the leaded glass rosette window. Many have come for a night and stayed several. Bon vivant!